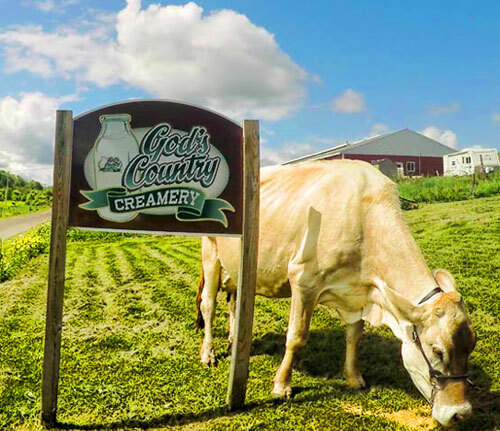 God's Country Creamery, nestled in the peaceful Potter County hills of Pennsylvania, is a family-owned and operated dairy operation dedicated to quality, hand-made artisan cheeses. Located near the small town of Ulysses, our artisan cheeses are made right on the farm from all-natural, clean raw-milk, free from artificial growth hormones. The mountain spring water and lush green grass on the farm give the milk a delicious, fresh and sweet flavor. The creamery strives to produce a delicious quality product which inspires confidence in you, the consumer. Once you taste our farmstead cheese, we believe you will agree that our cheese just tastes better. The grass-based diet that our cows eat and the raw milk we use to make cheese yields some of the tastiest cheeses around. We invite you to take a few moments to explore our website to learn more about our operation and specialty cheeses.